This is it folks. 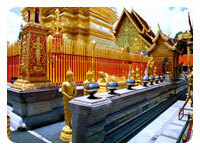 If you don’t visit Doi Suthep temple, you ain’t been to Chiangmai. So, grab your credit card and sign on the dotted line. The trip begins with a pleasant winding drive up 3,500 feet above sea level. You then huff and puff as you ascend up the steps to the temple, guarded by two splendid nagas (naks). 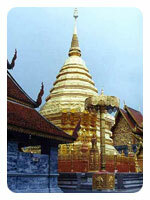 Wat Prathat Doi Suthep, built in 1383, is the symbol of Chiangmai. It is the most sacred temple in the city and contains the holy relic of the Lord Buddha which is enshrined in the magnificent golden pagoda. A panoramic view of the city and the surrounding countryside can be seen from the temple grounds.